> From the desert of Turkana we land in Uganda, just over an hour a way, which is lush with vegetation. Of course we could not go directly we had to go back to Nairobi and fly back up. Then a 3 hour drive brought us to Jinja, a town famous for being at the source of the River Nile. 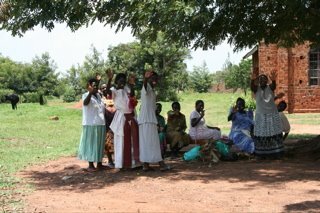 Our time was fruitful during meetings with 5 women’s self help groups. 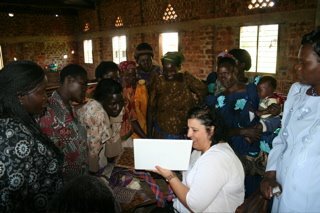 Mama, who they refer to as the leader of this NGO continues with her heart to help improve the lives of women. She along with a minimal staff has founded 100 of these self help groups, along with other creative enterprise including chicken farming. She has facilitated new schools being built and now focuses on a shelter for women. 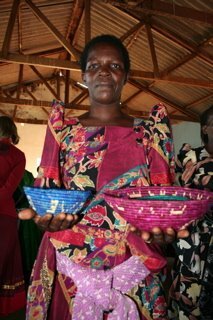 It’s exciting to see the women light up when they hear new ideas like taking their weaving and turning it into belts, or new styles of purses. 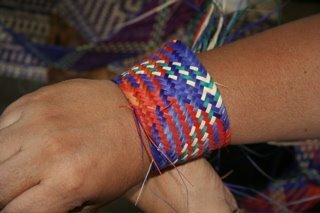 Or using the paper beads that they make into necklaces, to accent the purses and baskets. They are not only using reeds and banana fiber but recycled bags, too! 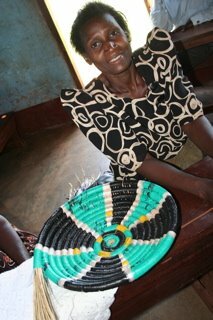 The creativity is encouraging and with simple changes and suggestions, the women begin to share their own ideas. And when Debbie pulled out the computer to show some designs and products, it really created quite a stir. On our way to the villages we stopped by the source of the Nile. Our big sightseeing adventure.